Favorite outdoor summer beach decor ideas, making summer living at home as beachy as it can be. 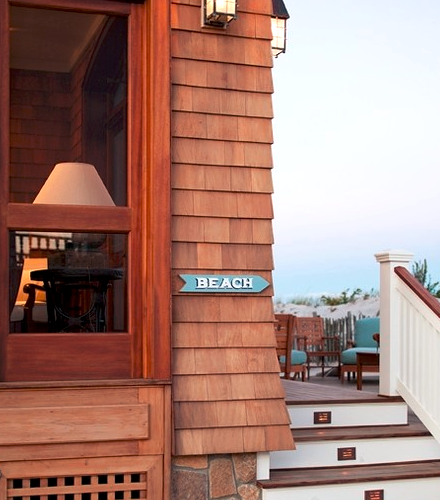 Pretend that the beach is just around the corner with a beach sign. Make one, Buy one, Stake one. Outdoor Spaces Designed as Living Rooms are simply the best. Just bring out a few accessories for the Summer Season, including art. The all American Adirondack Chair is perfect for the laid back beach decor theme. Via Traditional Home. Add summer colors and home-iness to your outdoor space with flowers. 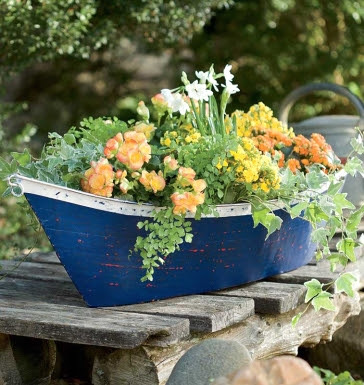 Do it coastal style with Miniature Beach Garden Pots, Painted Terra Cotta Pots, Shell Embellished Pots, or Boat Planters like this beauty from Plow and Heart. Be expressive with your outdoor lighting. 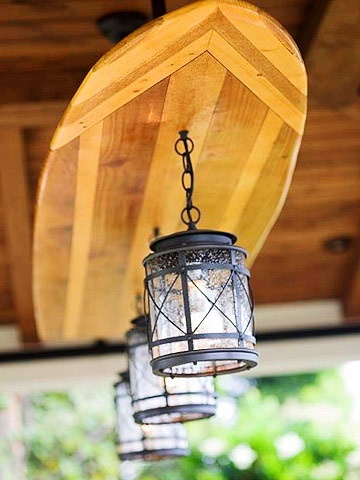 If you love to surf, bring on the Surfboard, make some cool Buoy Lamps, an Oyster Chandelier, or a Rope Shell Chandelier. Bring your beach finds to the yard. For example, a sculptural piece of driftwood makes a fabulous addition to your garden as featured on DIY Coastal Garden Ideas. Or how about accidental art? This broken urn was fixed up with shells from the beach. Via Connecting Pieces. 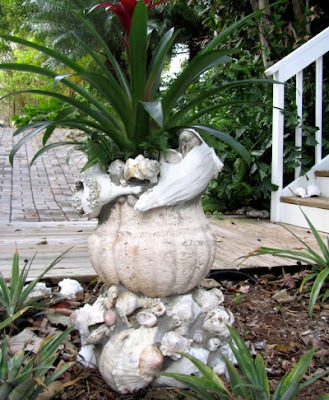 For more ideas, check out Beach Zen Landscaping and Seashell Gardens. Hook it up coastal style. You might want some hooks outdoors to hang decorations or organize stuff, such as garden tools. Here oars do the trick. Seen at Better Homes and Gardens. For driftwood planks in action, organizing garden tools, click here. 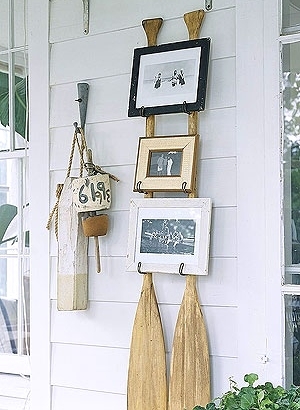 And check out the fun Nautical Wall Hooks by the poolside. And not to forget your entry. Add a splash with a fun Beach Doormat, or bring Summer Beach Decor to your door with a Shell Wreath. 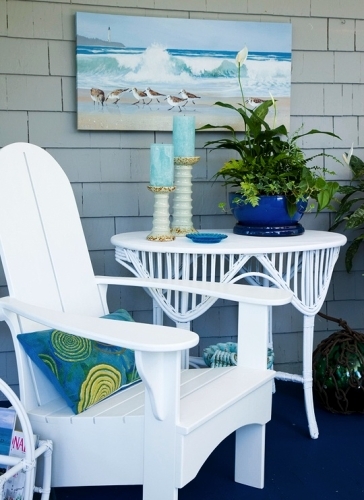 Outdoor summer beach decor with a breezy attitude that might make you want to staycation.